Eagles – On The Border | Gary Burden for R. Twerk & Co. This image was created by renowned Navajo artist Beatien Yazz. I bought the original at a rummage sale for a quarter without knowing it was an original painting or who the artist was. I just thought it was a beautiful thing. When it came time to create the artwork for On The Border I pulled out this piece of art, which I had been thinking about and suggested it to the band for the album cover. Everyone agreed that it would be perfect. I researched and found out who the artist was. When I tracked him down the best I could find was that he picked up his mail at a trading post on the Navajo reservation. The record company sent a sizable check to the artist and we never heard if he got it or not. If so it must have come as a surprise, money out of the blue. I always have felt good that millions of people who bought or saw this Eagles album cover, who never would have been exposed to this wonderful Navajo art otherwise, got to see it and hold it in their hands. A painting by a great Navajo artist immortalized by a rock and roll band’s album cover is a very good cross cultural exchange thing. My friend and brother artist Rick Griffin created all of the beautiful type for this album cover. I still have the original piece of art and still think it is a beautiful thing, now it’s a famous beautiful thing. I love that LP cover. We used to have it before ditching vinyl(oops) and it was a thing of great pleasure to hold and to look at. As I recall the paper used had a texture that really set off the graphics and typset. You should be proud of that work. My dad was a huge Eagles fan - especially "On the Border." Alas he passed away a month ago, but we sent him off on the next leg of his journey to "Ol'55' and LOUD, which he would have loved. Do you know of any quality prints available of this work. I'd like to source one to hang in my den. I love that On The Border cover too. It is based on a piece of art I found at a rummage sale for $.25! It was the original piece of art. I later found out it was made by a famous Navajo indian artist Beatien Yazz and was/is quite valuable. Sorry about the passing of your father but it sounds like you gave him a great send off. 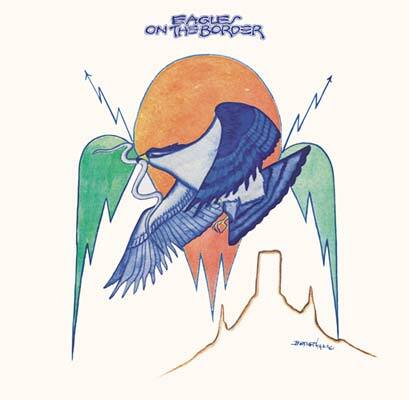 Just letting you know, the cover artist for the Eagles "On the Border" is my father, Beatien Yazz a.k.a. Jimmy Toddy. He did get the check in the mail via the Wide Ruins Trading Post; Wide Ruins, Arizona. He was so honored and surprise to have his art featured on an album cover. He still resides in Wide Ruins, and now retired from painting. He is now 86 years old, and the internet features a lot of his work as well. His works are also in many private and public collections. I am very much interested on knowing if you would be willing to sell the album cover? I am also an illustrator and painter as well. My works can be seen at several websites. I loved that artwork so much that I commissioned a friend to recreate it for me at a much enlarged 36" x 36" size in colored pencil. My brother hand build a frame from solid cedar and I had it hung in my music room at my parent's home from the late 70s until it was sold a few years ago. I now have it at my house, but unfortunately don't have wall space big enough to accommodate it. But it is a beautiful work!